The Sinus milieus represent a social and target group model that groups people according to their lifestyle and values. The Sinus milieus of the Sinus Institute are determined as part of the Reiseanalyse and can be combined with all other data on travel behaviour. Since the RA 2012, an evaluation option according to Sinus-Milieus® has formed an integral part of basic participation in the survey. The Sinus milieus are the result of over 30 years of social science research. They group people together who share similar attitudes to life and lifestyles. Basic values are taken into account as part of the analysis along with everyday attitudes to work, family, leisure time, money and consumption. In other words, they put the spotlight on the individual and his or her entire reference system of relationships with others and the immediate environment. The integration of Sinus milieus in the RA 2012 made it possible for the first time to analyse the Sinus milieus in detail regarding travel behaviour and tourist attitudes. The analysis described in this report highlights parallels which emerge between attitudes in everyday life and attitudes to holidays of the various milieus. This ultimately answers the question as to the “content” that is likely to attract customers from the relevant milieu. Vice versa, the integration of Sinus milieus in the German Holiday Survey means that tourist target groups can now also be analysed in terms of the milieus represented. Knowing what makes customers from the various milieus tick – in everyday life and on holiday – provides a more in-depth understanding of the target group’s needs, expectations and preferences. 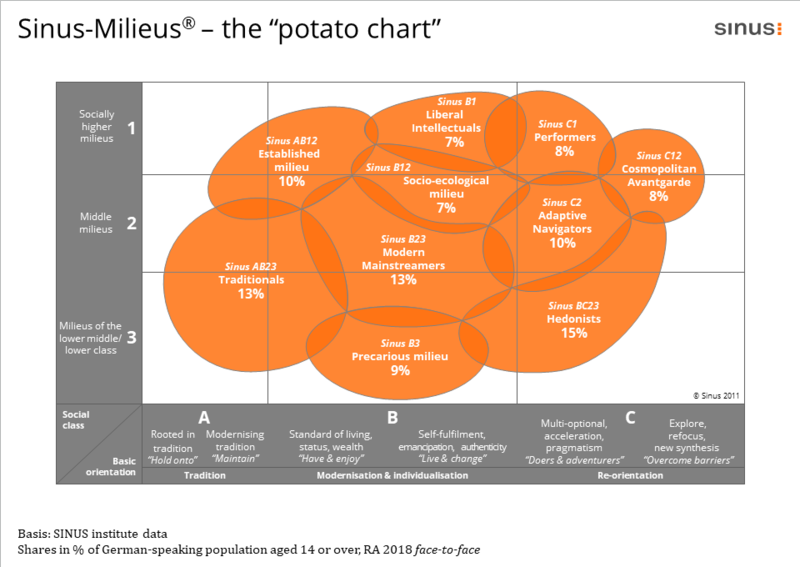 The “potato chart” illustrates the current milieu structure and the position of the various milieus in German society according to social circumstances and basic attitudes. The higher a specific milieu is located in this chart, the higher are education, income and occupation. The more to the right of the chart a milieu expands, the more modern is the basic attitude of the relevant milieu in socio-cultural terms. Products, brands and media can be positioned on this “strategic map”. In addition, the chart highlights that the boundaries of the milieus are fluid. The environment in which people live cannot be delineated as (apparently) clearly as social classes. According to the Sinus Institute, this is the “blurred nature of social reality”.